F Brett Bulmer (Kelowna, 2008-12) has signed a one-year contract with Ilves Tampere (Finland, Liiga). Last season, he was pointless in three games with the Minnesota Wild (NHL), and had three goals and eight assists in 58 games with the Iowa Wild (AHL). . . . As a result of Ilves’ decision to sign Bulmer, it has released F Mitch Wahl (Spokane, 2005-10). Wahl had a goal and three assists in 16 games with Ilves. . . .
F Jakub Langhammer (Spokane, 2002-04) has been released by the Manchester Phoenix (England, Premier). He had four goals and three assists in 14 games. Brent Sutter, the owner, general manager and head coach of the Red Deer Rebels is an intense competitor. Hey, when’s the last time you saw him smile during a game? But if you’re in Everett tonight you just might see at least a bit of smile. That’s because his Rebels are up against the Silvertips, whose roster includes F Riley Sutter, who is a nephew. Ron Sutter, one of the twins, is Riley’s father. . . . “I think it’s definitely going to be exciting for sure since I didn’t get the chance to play last (season) against him,” Riley told Jesse Geleynse of the Everett Herald.“It’s going to be something to think about. You always want to beat your family.” . . . So what's his uncle like? "I don't think he's too much different than (his brothers)," Riley told Geleynse. "They're all pretty similar. All the coaches (who) are Sutters are pretty hard at the rink, but away (from it) they're nice guys." . . . Geleynse’s story is right here. Hockey Canada’s national junior team selection camp will run from Dec. 11-14 at Blainville, Que., the home of the QMJHL’s Blainville-Boisbriand Armada. . . . The camp will include three exhibition games — Dec. 12 and 13 against a team comprising Canadian university players and Dec. 14 against Czech Republic. . . . Team Canada will be preparing for the 2017 World Junior Championship that is to run Dec. 26 through Jan. 5 in Toronto and Montreal. . . . The 22-player Canadian roster is expected to be named on Dec. 15, although it doesn’t have to be finalized until Dec. 25. . . . In advance of the tournament, Canada will play exhibition games against Finland (Montreal, Dec. 19), Czech Republic (Ottawa, Dec. 21) and Switzerland (Toronto, Dec. 23). . . . Canada opens the WJC in Toronto on Dec. 26 against Russia (8 p.m. ET) and plays Team USA on Dec. 31 in Toronto (3:30 p.m. ET). Bob Mackin of Business in Vancouver has weighed in with a piece on the proposed class-action lawsuit that the CHL, WHL, OHL and their teams are fighting. . . . Mackin’s piece is right here. . . . Collin Gallant of the Medicine Hat News examines the proposed lawsuit from the Medicine Hat Tigers’ perspective in a story that is right here. The Kamloops Blazers dropped G Carter Phair, who turns 18 on Dec. 15, from their roster on Tuesday. He is expected to return to the SJHL’s Weyburn Red Wings. The Blazers acquired Phair from the Edmonton Oil Kings, giving up a fourth-round pick in the 2018 bantam draft, hoping he would provide them with some depth at the position. However, he was struck in the head with a puck during a practice in Alberta and suffered a concussion. He got into only one game with the Blazers, going 4.68, .842. . . . Phair, a native of Carnduff, Sask., played 19 games with the Red Wings last season, going 8-4-3, 2.47, .925. . . . The Blazers are down to 24 players, including two goaltenders — Connor Ingram and Dylan Ferguson — and nine defencemen. Patrick Conway, who keeps tabs on goings-on in the KHL, has checked in with his weekly team-by-team roundup. You have to read it to believe what has been happening with Neftekhimik Nizhnekamsk, which is on its third head coach of this season — in fact, it went through three head coaches in the month of October alone. . . . Conway’s latest report is right here. Chippy & sloppy game with lots of special teams... Not an easy watch in Kelowna tonight. victory over the Rockets. . . . The Blazers now are 9-8-0. . . . The Rockets, also 9-8-0, had a six-game winning streak come to an end. . . . 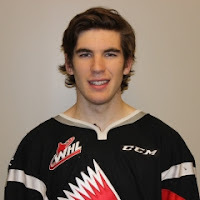 The Blazers got the game’s first two goals, from F Nick Chyzowski, his seventh, at 2:53 of the first period, and Sideroff, on a PP, at 13:07. . . . Kelowna F Nick Merkley scored his third goal at 18:37, on a PP. . . . F Rudolfs Balcers, a Latvian freshman, got his seventh goal for Kamloops at 1:45 of the second period. Blazers also had an assist. . . . Sideroff’s ninth goal, on a PP at 11:17 of the third period, added more insurance and F Matt Revel scored his sixth goal at 16:05. . . . F Collin Shirley drew three assists for Kamloops. 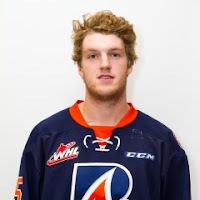 A 37-goal scorer last season, he’s got six goals and 12 assists in 17 games this time around. . . . Kamloops also got two assists from F Garrett Pilon. . . . Kamloops G Connor Ingram stopped 20 shots, 14 fewer than Michael Herringer of Kelowna. . . . The Blazers were 2-7 on the PP; the Rockets were 1-7. . . . The Rockets lost F Leif Mattson with a checking-from-behind major and game misconduct at 16:39 of the third period. . . . Announced attendance: 4,369. At Moose Jaw, G Zach Sawchenko stopped 41 shots as the Warriors got past the Prince Albert Raiders, 3-1. . . . Sawchenko was especially solid in the third period when the Raiders failed to score despite holding a 22-8 edge in shots. . . . F Jayden Halbgewachs scored twice for the Warriors, giving them a 1-0 lead at 2:21 of the second period and putting them in front 2-1 at 4:22 of the third. He’s got 11 goals in 15 games, after putting in a career-high 15 in 69 games last season. . . . F Luke Coleman scored the Raiders’ goal, his fourth, at 6:06 of the second period. . . . F Tanner Jeannot got the empty-netter for Moose Jaw at 19:58 of the third. He’s got four goals. . . . G Nick Sanders stopped 26 shots for the Raiders. . . . Prince Albrert was 0-4 on the PP; Moose Jaw was 0-5. . . . The Warriors (9-3-2) have won two in a row. . . . The Raiders (4-10-1) have lost three straight. . . . Announced attendance: 3,099. Had to dig a little bit to find a relevant fact for tonight. This will mark 1st time TBirds have played a team from Saskatchewan on Nov 1st. victory over the Blades. . . . The Thunderbirds (5-6-1) are 2-1-0 on their six-game East Division trip. . . . The Blades slipped to 7-8-1. . . . The Thunderbirds scored the game’s first three goals, all of them via the PP. At that point, Seattle had scored six times on nine PP opportunities over two games. . . . D Jarret Tyszka’s first goal got the visitors started, at 2:51 of the first period. F Alexander True made it 2-0 with his fifth goal 56 seconds into the second period. F Donovan Neuls’ third goal upped the lead to 3-0 at 1:51. . . . F Michael Farren’s first goal got the Blades on the board at 6:04, but Seattle F Scott Eansor scored shorthanded at 9:32. He’s got two goals. . . . Saskatoon made it interesting as F Josh Paterson got his fifth goal at 1:39 of the third period and F Mason McCarty made it 4-3 with his 10th goal at 18:44. . . . Seattle got two assists from F Nolan Volcan, with Eansor adding one to his goal. . . . Paterson also had an assist. . . . Seattle G Rylan Toth, who is from Saskatoon, stopped 21 shots. . . . 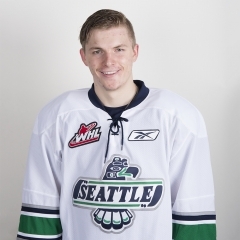 The Blades started Logan Flodell, who had been acquired from Seattle earlier this season. He was gone after allowing three goals on 19 shots in 22:05. Reliever Brock Hamm stopped 13 of 14 shots in 36:51. . . . Seattle was 3-6 on the PP; Saskatoon was 0-4. . . . F Mathew Barzal, who is eligible to play for the Thunderbirds, again was scratched by the New York Islanders last night. They lost 6-1 to the visiting Tampa Bay Lightning. . . . Announced attendance: 2,812.
the Red Deer Rebels, 6-4. . . . The Rebels (8-6-2), who have lost three straight, overcame a late two-goal deficit before losing. . . . The Royals (9-7-2) had lost their previous three games (0-1-2). . . . After F Jared Dmytriw’s sixth goal got the Royals started at 8:07 of the first period, the visitors took the lead when F Grayson Pawlenchuk scored his fourth goal at 14:35 and F Dawson Martin got his third, at 15:25. . . . Victoria followed that with the game’s next three goals, as F Matt Phillips got his ninth at 7:00 of the second, F Tyler Soy scored his 10th at 17:24, and F Dante Hannoun counted No. 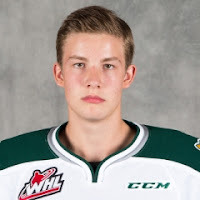 8 at 10:06 of the third. . . . Red Deer D Josh Mahura, who also had an assist, got his guys into a tie with goals at 13:39 and 15:57. . . . F Ethan Price iced it for the Royals, scoring his second goal of the season into an empty net. . . . Victoria D Chaz Reddekopp earned three assists, while Peckford, who has five goals this season, and Soy each had one. . . . 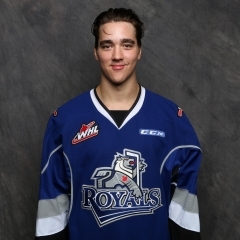 The Rebels got two assists from D Austin Strand. . . . G Griffen Outhouse blocked 40 shots for the Royals. The Rebels got 30 saves from Riley Lamb in 58:18. Lasse Petersen wasn’t tested in a 46-second stint. . . . Red Deer was 1-6 on the PP; Victoria was 0-4. . . . Announced attendance: 3,032. Moose Jaw at Brandon, 7 p.m.
Red Deer at Everett, 7:05 p.m.
Seattle at Prince Albert, 7 p.m.